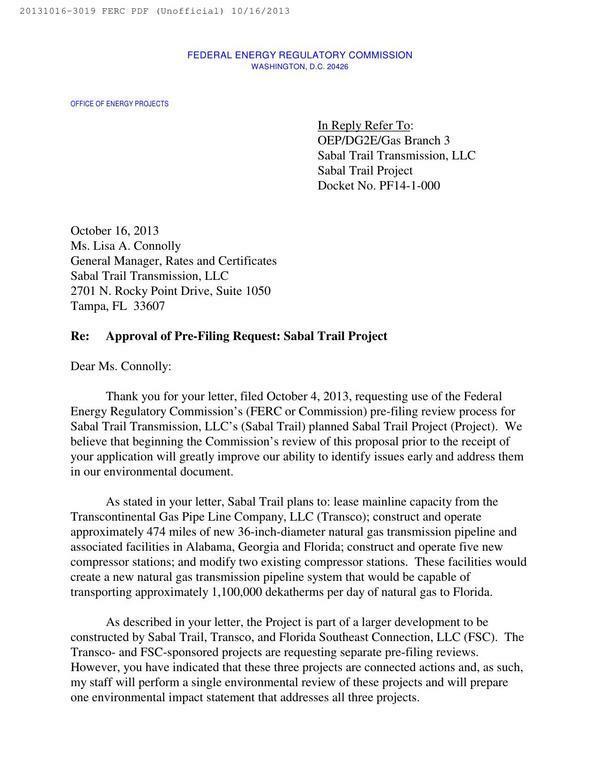 As stated in your letter, Sabal Trail plans to: lease mainline capacity from the Transcontinental Gas Pipe Line Company, LLC (Transco); construct and operate approximately 474 miles of new 36-inch-diameter natural gas transmission pipeline and associated facilities in Alabama, Georgia and Florida; construct and operate five new compressor stations; and modify two existing compressor stations. These facilities would create a new natural gas transmission pipeline system that would be capable of transporting approximately 1,100,000 dekatherms per day of natural gas to Florida. As described in your letter, the Project is part of a larger development to be constructed by Sabal Trail, Transco, and Florida Southeast Connection, LLC (FSC). The Transco- and FSC-sponsored projects are requesting separate pre-filing reviews. However, you have indicated that these three projects are connected actions and, as such, my staff will perform a single environmental review of these projects and will prepare one environmental impact statement that addresses all three projects. Your letter also indicated that Sabal Trail intends to file an application in October 2014. 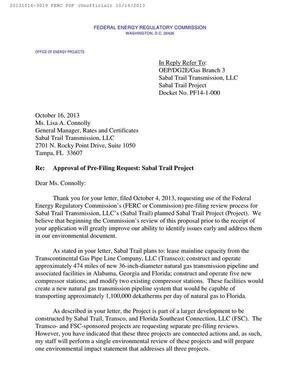 When Sabal Trail files its application with the Commission, we will evaluate the progress made during the pre-filing process, based in part on our success in resolving the issues raised during scoping. Once we determine that your application is ready for processing, we will establish a schedule for completion of the environmental impact statement and for the issuance of all other federal authorizations. 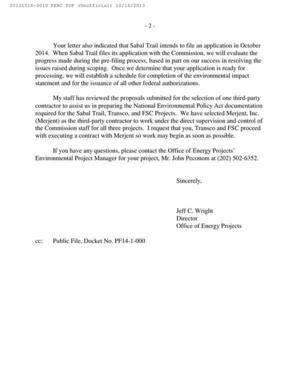 My staff has reviewed the proposals submitted for the selection of one third-party contractor to assist us in preparing the National Environmental Policy Act documentation required for the Sabal Trail, Transco, and FSC Projects. We have selected Merjent, Inc. (Merjent) as the third-party contractor to work under the direct supervision and control of the Commission staff for all three projects. I request that you, Transco and FSC proceed with executing a contract with Merjent so work may begin as soon as possible. 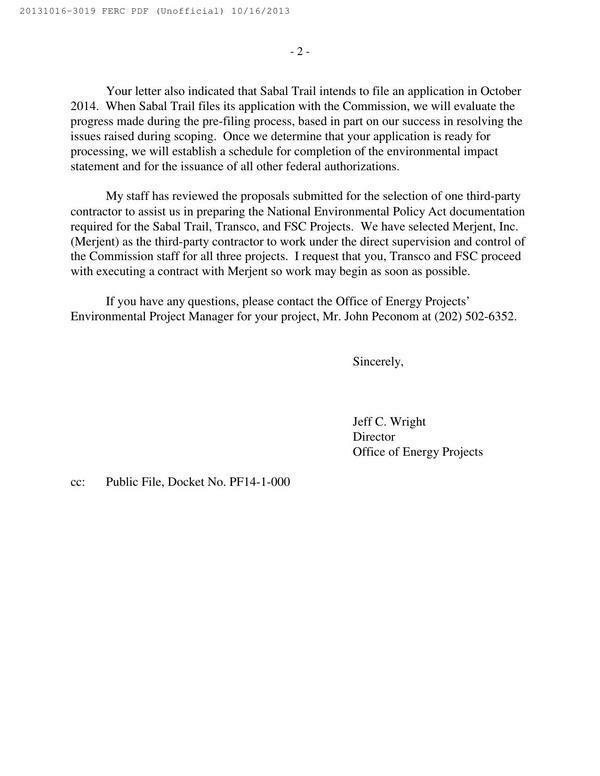 If you have any questions, please contact the Office of Energy Projects’ Environmental Project Manager for your project, Mr. John Peconom at (202) 502-6352.